Good news! Through the kindness of a generous donor, the domain name www.southwestlouisville.com now points to The Valley Report. It can also be accessed through the original address at http://valleyreport.blogspot.com. Thanks, and help spread the word! City Block, the entertainment complex formally known as O'Malley's Corner, has closed. The place had been in business for 18 years and employed 100 people. Owner Ward Plauche says City Block was at a competitive disadvantage, having to go up against corporate-owned and city financed 4th Street Live. Plauche has been trying for 2 years to meet with city officials to discuss help for his business. The promise of city help finally came Wednesday, the day the bar closed. Louisville Metro Economic Development Director Bruce Traughber offered $200,000 in forgivable loans which has been termed by the owners as "too little, too late". City Block's owners had invested over $20 million into the property since the late 1980's. The city has dumped millions into Cordish Co.'s Fourth Street Live project, most recently to renovate a bowling alley into a sports bar. The city has guaranteed Cordish yet another $850,000 for an unnamed renovation of the complex downtown. The CJ is covering the story HERE. I cannot properly express to you how utterly stupid this situation has become. The city lets a local business owner fail by financially backing a competitor, then refusing to help the local guy. Bands will include The Glasspack, Broken Spurs, Brett Ralph's Kentucky Chrome Revue, Snake Eyed Savior and Stonecutters. Featured artists are Sean Garrison, Dave Pollard, Rakutt, Laura and Louis Orr, Larry Elmore and Jeff Gaither, who created the poster art used on the "Guitar Hero" menu screens. "We hope to bring folks out to this end of town to see that the South End has more to offer, and that they will have an enjoyable time and come back," Rakutt said. "We also want to inspire other South End artists. This is a step up for the South End." All of the musical acts at the festival are either from the South End or have some type of connection to it. Come on out and see what you are missing. 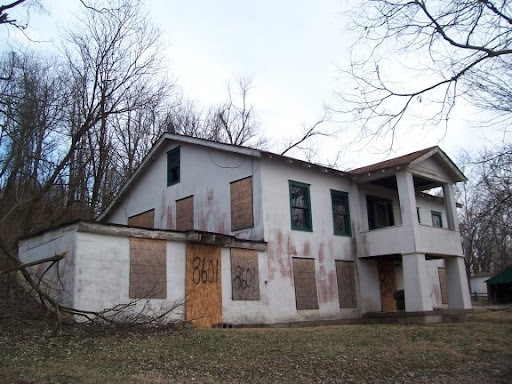 - The son of Dr. Hicks, the man who built the brick home on the hill above the residence, was the same man who erected the world famous "Jesus Saves" sign visible from Dixie Highway. - A family from England with 3 special-needs children lived in the home in the early 1970's until one of the children passed away. - A man named Fred Wilson owned the home during WWII, and military wagons brought wounded soldiers to Muldraugh Hill where they boarded a train. The train reportedly brought the wounded to the home. - The tracks in front of the home used to be a "wagon path". The path was traveled by military Jeeps before trains rode the rails. - There are reports of some sort of train depot at the site, although the time period is not known. I will be contacting the Filson Historical Society tomorrow, and I am waiting for replies from other historical preservation clubs and individuals. More info when I get it. WLKY is reporting on a story that needs some attention. Two local guys are renting an apartment at the complex known as "The Oaks of St. Andrews", located in South Louisville on Brooklawn Drive. It seems to have what professionals may deem a "rodent problem". The men became aware of the infestation in January and notified the out-of-town landlord. Anonymous tenants claim there were 13 dead mice occupying a single unit, and residents say they cannot bring food or children into the space because of the rotten living conditions. The manager of the complex laughed at tenants when they complained. Maybe you long for a quiet, comfortable home with an excellent location or the prompt maintenance. Perhaps it's the friendly atmosphere. Whatever the reason, The Oaks at St. Andrews is apartment living at its best! This community is what easy living is all about. It features all the amenities and comforts any discriminating apartment shopper could want. And it's close to major employers, fine restaurants, Dixie Manor, Westland Mall and Southern Terrace. The Oaks at St. Andrews... you'll be proud to call it home. I cannot imagine anyone having to live in these conditions, especially in America, 2009. The two guys have a lease that isn't up until August, and if they took the owner's offer to move to a new location, the guys would be out many green dollars transferring things like cable installation and utilities. Not to mention the guys would still be living under the same group of slumlord's that allowed this situation to spiral out of control. Someone connected with the case called Metro Call 311 to complain, but the operator reportedly told the caller it would be 20 days before someone could handle the problem. Think about this, and if there are any attorneys out there who want to do a good deed, look these guys up. Tip O' the Hat goes to my friend Steve from Louisville History & Issues. The month of April is still with us, but The Valley Report has already received a record number of visitors for any month. I want to express my thanks to you for making this blog a part of your day. Visitor participation has grown steadily over the last few months, page views are way up and the time spent on the site is growing dramatically. We have done all of this mostly through word of mouth and some favors from my buddy at The Local Weekly. A few generous readers have kicked in the PayPal "Tip Jar", and to you, I am humbled and very grateful. Thank you. Your donations have enabled me to upgrade equipment and add some things that aid in the reporting of more stories of interest to Southwest Louisville. As funds become available, a major ad blitz is among the possibilities. I have been busy with errands lately and posting has been light. Once the schedule clears I will be back full-time. Look this evening for another Hicks Home update. In the meantime, please keep sending in those leads and emails. You have made this effort worthwhile. Okay. The mayor's Community Conversation for the month of April was lightly attended. It has been mentioned that perhaps Southwest residents are satisfied with their lot, hence the lack of complaints, challenges or traditional outbursts at the meeting tonight. Whatever the reason, the mayor seemed happy, upbeat and emerged completely unscathed. There were a few up and coming guys in local politics present, and I was glad to get a few moments with them to ask about their positions on issues. Marty Meyer is running for State Senate in District 38. He's very knowledgeable when it comes to the 38th District. If you see him out somewhere, talk to him. You will not be disappointed. David Yates was also present. Yates is a young attorney with a remarkable record on consumer protection litigation. He also has a great family. Watch this guy closely. He will be a power player. Trust me, I know these things. - If you have some free time this evening, stop by the Mayor's Community Conversation. This month's meeting is being held at Stuart Middle School, 4601 Valley Station Road. The fun begins at 6:30 PM. I hope to see many of you there. - WHAS11 is running an "Ask the Mayor" segment once a month. Questions can be submitted HERE. Since my request for information was published by my good friend Trevor Hemingway of The Local Weekly, emails have been coming in with some delightful memories and very valuable information. I am in the process of compiling the facts and making contacts regarding the structure, located at 8601 Dixie Highway. The home apparently belonged to a Dr. Hicks who maintained a medical office in the rear of the home. There will be much more information made available on the home shortly. - I received a message from Robert Price of The Southwest Dream Team. Mr. Price says Seay Properties is reviewing several possible tenants for the old Dillard's/Bacons building in Shively Center, not just the Peddler's Mall, and that there is currently NO LEASE AGREEMENT. This statement is contrary to the one made by the owners of the Peddler's Mall. The Peddler's state they are ready to move in July. Price, however, is confident that a business that is deemed a "good fit" for Southwest Louisville will enter into an agreement for the space, and has vowed to fight any negativity associated with Seay Properties. My comments on the situation were not meant to disparage Seay Properties, but to arm the community with enough information to make a decision on how to react. The folks at The Southwest Dream Team continue to come up with great ideas to promote our area's best interests, and I have full faith in Mr. Price's knowledge of the situation. If Robert Price says the Dillard's building in Shively will get a "good fit" tenant, I believe him. Please mark your calendars! The next meeting of the Southwest Dream Team will be on Thursday, May 7th from 9:00-10:30am at the Waverly Hills Sanatorium. We will hear the most recent updates and reports from our busy committees. Benton Seay of Seay Properties will be our special guest speaker. To access the building enter off of East Pages Rd like you were going to Bobby Nichols Golf Course. Simply follow the road up the hill and to the left. If you would like to tour the Waverly complex you are encouraged to call 933-2142 now, to make your reservation. There will be one tour and only 40 people will be permitted to go. Please make plans and call them soon. The complete tour will feature, The Body Shoot, Room 502, and the Children’s Ward, breezeways, the morgue and many other areas of the building. Comfortable walking shoes are strongly recommended. Please note that you must be able to walk down and back up the hill on the body shoot portion of the tour. The building is dusty and appropriate clothing should be considered. Children under 10 years of age will not be permitted. You may bring a camera, however, video cameras and bright lights will not be allowed. It is recommended that you bring a small flashlight to assist in darkness and low light conditions. Your guided tour will take approximately two hours from beginning to end. There is a charge of $22.00 per person, if paying by credit card. A discount of $2.00 will be given to those paying with cash. The Mattingly’s are very proud of Waverly and have invested a lot of time and personal resources into the refurbishing of the property. The work is funded solely through the income received from these tours. I am sure you will agree the tour is worth the money. They have a long way to go with lots of work yet to do. Your tour dollars will accelerate its completion. I enjoyed my tour and I am sure you will too! I hope to see you then.